ORWELL – Mitchell Lake takes over as the head coach of the Grand Valley Mustangs softball team. Lake had worked as a junior varsity coach for the Mustangs last season. Grand Valley finished 14-12 last season. “I’m excited for the season. We have a young group this year and this will be a good test to see what they can do next year,” Lake said. The Mustangs will be returning: Megan Hopes, Alexis Cooper, Izzy Scarberry, Hallie Soltis, Amanda Hayes, Nicole Phillips and Obreonna McLean. Emily Elrand and Emma Sullivan, both freshman, might also see playing time for Grand Valley this year. 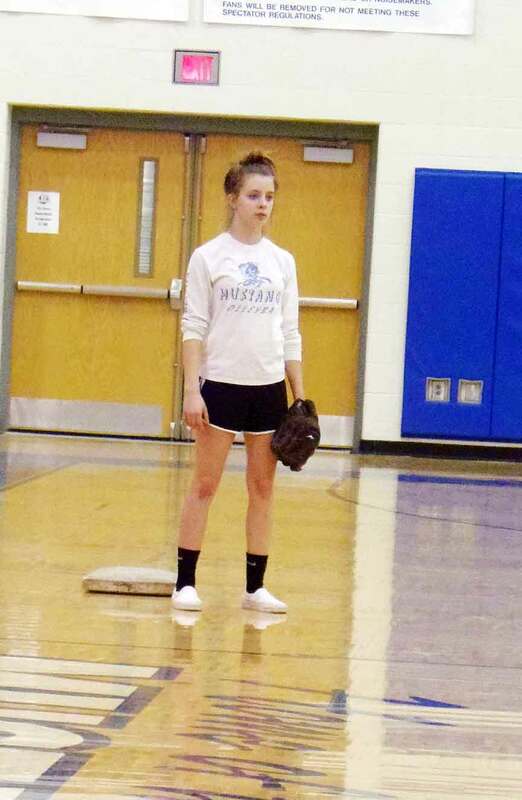 The Mustangs also hope to get some pitching from both Summer Poyer and Madi Takacs this year. “We started out on short notice,” Lake said as he just took over the job last week. We’ve only had two or three practices and we had our first scrimmage last week,” Lake said. The Mustangs will face some tough competition in the conference and in tournament play this season. Grand Valley as a team was one hit by Mathews in two games last year and no hit by Champion. “We’re working on hitting faster and better pitching. We want to challenge them so they can improve,” Lake said on how practice is going. The Mustangs want to do well in the conference and compete with Mathews. “We have a tough schedule this year. 12 of the 25 teams we play are Division I or II schools,” Lake said. The goals for the Mustangs is to compete in the conference and win conference games. They want to finish above .500. Grand Valley also wants to have as least amount of errors out of all the conference teams in the conference and be a solid defensive team. “We’re working on the fundamentals and base running. We hurt ourselves on the bases last year. We also want to shake things off. If we make an error we don’t want to let it have a snowball effect where we have a three or four error inning,” Lake added. The Mustangs start the season with an away game against Cardinal on Friday, March 29th. Grand Valley opens up at home on Monday, April 1st against Chalker. Pictured: Alexis Cooper, of Grand Valley, covers second base during a recent indoor softball practice.